Mark your calendar for Friday, March 3 at 11:00 a.m. Eastern for our Facebook Live event in partnership with PBS’ Mercy Street! Tomorrow, Garry Adelman, our energetic Director of History and Education, will step into the Stabler Leadbeater Apothecary Museum in Old Town Alexandria to discuss historical themes depicted in the TV show. He will present Civil War-era artifacts from the museum, give insights into 19th-century medicine, and cover the famous detective Allan Pinkerton with the rapid-fire speed of a Civil War-era Gatling gun which he will also cover! If you’re unfamiliar with the show, Mercy Street is a medical TV drama set in an Alexandria, Virginia military hospital during the Civil War. It is inspired by real people and events and features medical innovations developed during the war. But you certainly don’t need to be an avid watcher to enjoy this live broadcast! To participate in the event, head to the Civil War Trust Facebook Page on Friday, March 3 at 11:00 a.m. Eastern. You can leave questions for Garry in the comments section during the broadcast. Please feel free to share the event with your friends who might be interested! 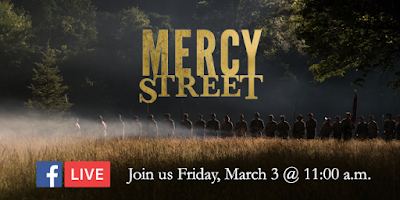 If you are following this season of Mercy Street on TV, you can get a peek of footage filmed on land preserved by the Civil War Trust during the season finale on March 5 at 8/7c!